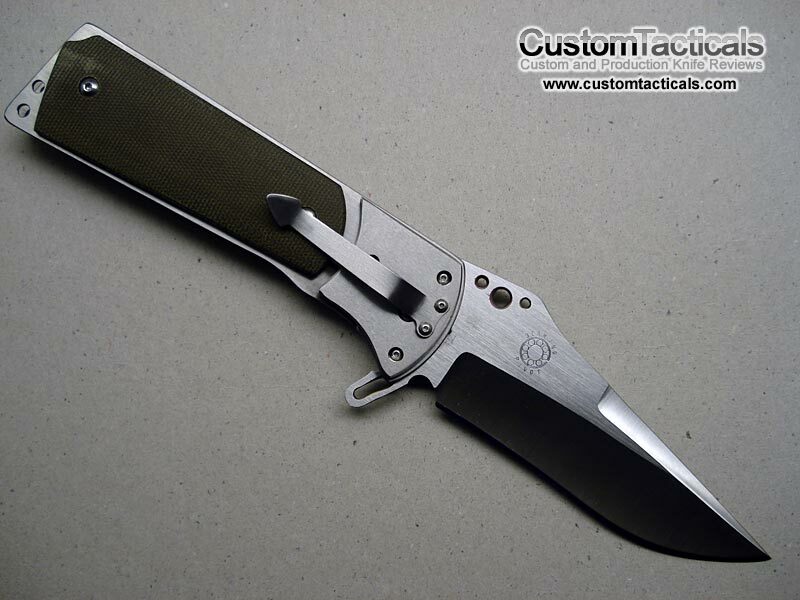 The Specs of Brad Duncan’s 1911 Hammer Trigger folder are quite impressive, with a imposing 4 1/2″ 154CM Stainless Steel blade and huge Titanium Framelock handle that sports G-10 Overlays that are identical to those on a 1911 Handgun. 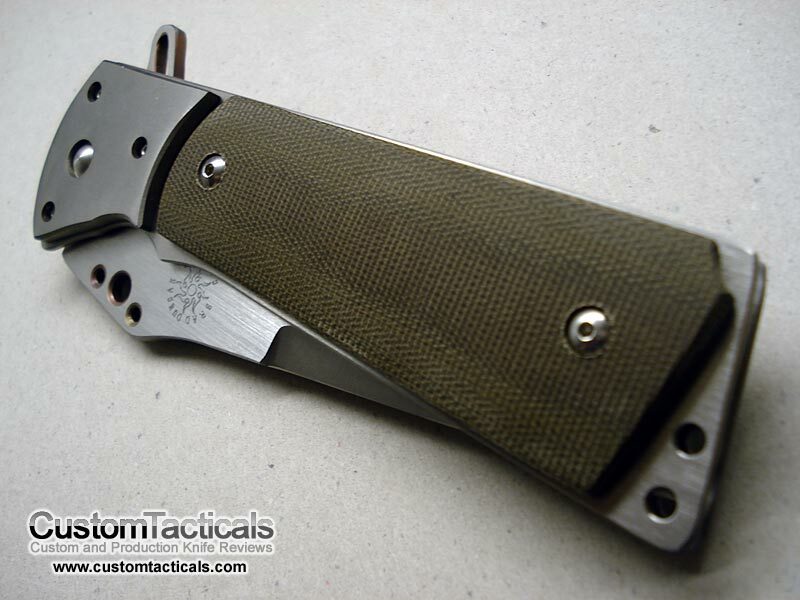 The grips are interchangable with any grips that you would find on the 1911 Handgun, giving gun collectors an additional avenue of fun with this knife. The knife features an IKBS Ikoma-Korth Bearing System in order to allow it to open faster and smoother than a traditional washer system. This is the intent, at least, but Duncan’s somewhat less than perfect fit and finish on this example means the action isn’t any smoother than a typical bronze washer, and may even be rougher. 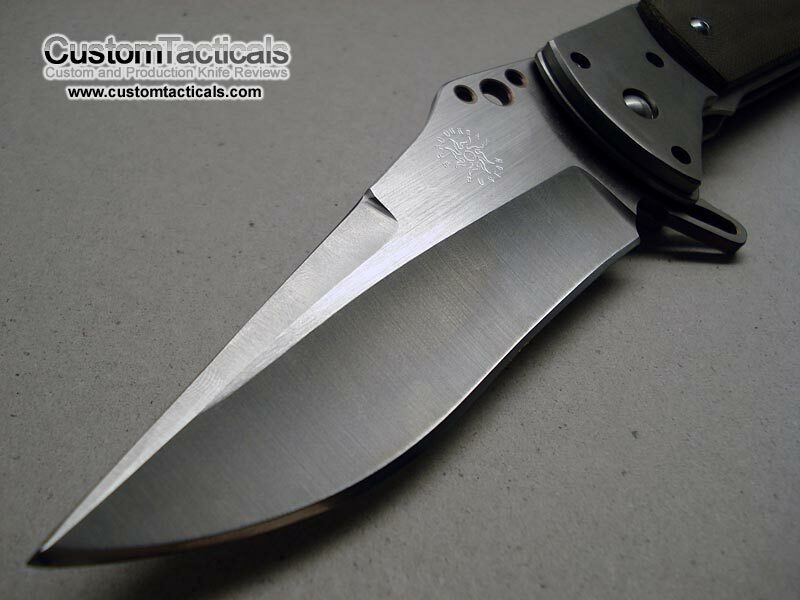 The finish on the blade and titanium frame are not spectactular, and are not as good as his work from several years ago when he first introduced the Whiplash and other knives, but with the plumetting values of his knives, a 1911 Hammer for $450 or so is not a bad deal since its such a large and nicely designed knife. Having said that, most people will not support him as a knifemaker anymore and would only purchase his knives on the secondary market out of sheer curiosity, like me. Overall, a decent effort by a knifemaker that used to be a much better craftsman. It is likely his orders are so backed up that he is rushing the work now just to have everything filled and avoid angry mobs and lawsuits. Hopefully he will return to greatness one day and right all the wrongs he has committed to his former customers. I was wondering if you had been in touch with Brad Duncan as I am his ex wife and his children would like to know where he is. Also if you have spoken or know how get in touch with him would you pls ask him to call his girls at 903-316-5632. Hi Darlene, Sorry I have not been in touch with him, nor do I know what he has been up to. Perhaps you should try the knife forums where a lot of other knife aficionados congregate? sent 3 knives back to brad for service never got them back ! now i cant find him . hey brad , its dave fillmore how about sending my knives back?its been 3 years. WTF? well after reading response from Mr. dave Fillmore // Thanks Dave for the update! Belt clip is too small…needs to be able to clip on to a 2 inch belt. Many prefer smaller “Pocket” clips.. as they are designed for pocket carry, not belt carry. Since it is a custom I am sure at the time it was ordered a longer clip would not be a problem. However, given that Brad has screwed a bunch of people back in the day its likely not going to be possible anymore.